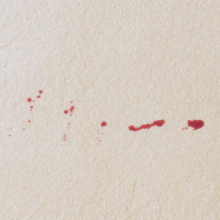 Blood stains are the least of your worries when an accident happens. But when you return from giving out plasters and cuddles or from A&E, your carpet might be worse for wear. Rug Doctor can fix that. The Urine Eliminator is perfect for removing organic stains like blood. Whether you need to look after your children or your pets, let Rug Doctor look after your carpet. You can use this product on other common stains too, such as vomit, urine and faeces. Plus, it will remove the foul odours that come with them. If you’ve got an emergency, our Urine Eliminator is there for you. If possible, start the treatment while the stain is still wet, to reduce the risk of the stain bleaching. 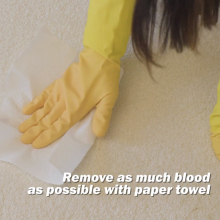 Put on household gloves, then soak up as much blood as you can using a clean paper towel or cloth. Wet the area well with the product, so it can penetrate the carpet backing. Do not dab the stain. 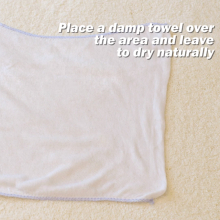 Place a damp, colour safe cloth or towel over the stain. Let it remain moist overnight and dry naturally, to allow the enzymes to work at optimum levels. Apply Urine Eliminator a second time if the area is heavily soiled. Return the trigger bottle nozzle to the OFF position and store it upright. If you notice discolouration once dry, dampen with water and blot. With Rug Doctor, you have options aplenty. The Urine Eliminator can be used as a pre-treatment before using a Rug Doctor machine. 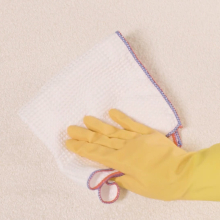 Why not try it out and discover how you can make your carpets look brand new? 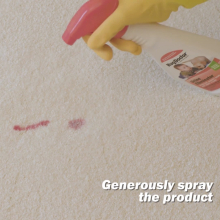 Did you know you can also use Oxy Power Stain Remover on blood stains? Its powerful formula provides incredible cleaning without damaging the surfaces in your home. Scrapes and falls are common – especially if you’ve got little ones running around. Keep a Rug Doctor product in your cupboard and know that no matter what comes your way, you’ll have things under control.